Free Shipping Included! 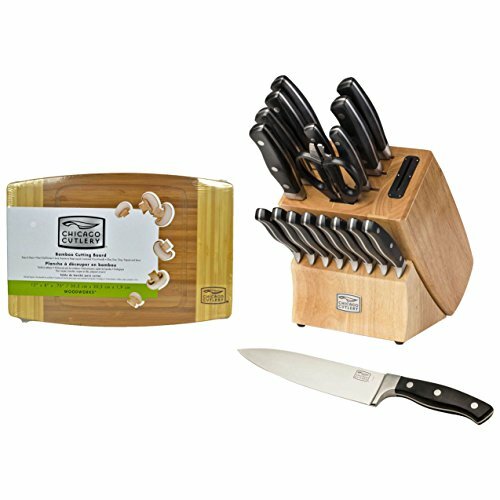 Chicago Cutlery 1117756 18pc Insignia 2 Knife Set and 1074564 12'' Bamboo Cutting Board by Chicago Cutlery at Sara Stage. MPN: 43178-217678. Hurry! Limited time offer. Offer valid only while supplies last. Professionals and home cooks alike will be able to find the knife they need every time with this Chicago Cutlery 18-piece Insignia2 knife block set. Professionals and home cooks alike will be able to find the knife they need every time with this Chicago Cutlery 18-piece Insignia2 knife block set. The Insignia2 collection is constructed of high-carbon stainless steel featuring an exclusive Taper Grind edge, which is extremely sharp and enables precise cutting. The high-carbon stainless steel blade is stain-resistant to provide long-lasting beauty and performance. The knives' full bolster provides users with balance and safety, while ergonomically-designed triple riveted black polymer handles combine comfort and safety with classic, reliable styling. These knives provide professional performance for the everyday cook who is looking to prepare meals more deftly. Included in this set are (2) paring knives, 3-in and 3-1/2-in, a 5-1/2-in utility knife, 8-in chef's knife, 7-in Santoku, 7-in bread knife, 5-in boning knife, 8-in slicer, a pair of shears, and (8) 4-1/2-in forged steak knives. Users can help prolong blade sharpness and protect countertops by performing cuts on the included Chicago Cutlery Woodworks 12-in bamboo cutting board. This attractive 2-tone wooden cutting board features a groove to catch liquid runoff from food that is cut, preventing it from spilling onto the counter. With its reversible design, users can help mitigate cross-contamination of food by cutting meat and poultry on one side and cutting produce on the other.